In this spirit, I thought it would be fun to look at a few pieces of the A Song of Ice and Fire series that George RR Martin has made larger than life. Hadrian’s Wall looks a little puny next to the Wall in Game of Thrones. Before them, the ice rose sheer from the trees like some immense cliff, crowned by wind-carved battlements that loomed at least eight hundred feet high, perhaps nine hundred in spots. But that was deceptive, Jon realized as they drew closer. Brandon the Builder had laid his huge foundation blocks along the heights wherever feasible, and hereabouts the hills rose wild and rugged1 . Henry VII used the dragon as one of his symbols, but in A Song of Ice and Fire this symbol becomes flesh. Given that invader-from-across-the-sea Henry VII might have inspired Daenerys, it seems fitting that, in Martin’s fantasy version of the Wars of the Roses, real dragons, and not mere badges or devices, sit on Daenerys Stormborn’s shoulders. Henry’s hereditary claim to the throne was weak, so he bolstered it by claiming he hailed from King Arthur. Adorning his images with dragons reinforced Henry’s “Arthurian heritage” in the common mind. Take, for example, this portrait of Henry VII with his family St. George and the dragon dominate the image. Henry VII was associated with dragons, as in this painting, “The Family of Henry VII with St George and the Dragon”. Henry is shown in the bottom, left of center. Built in 292 BC to commemorate the Greek island of Rhodes’ success at repelling its enemies, the Colossus of Rhodes – once one of the seven wonders of the World —is literally dwarfed by a product of George RR Martin’s imagination: the Titan of Braavos. By my calculations, the Titan of Braavos may be as tall as 300 feet, which makes it a good 140 feet taller than the Colossus of Rhodes.2 Plus, unlike its real-world inspiration, the Titan is a weapon. The Titan has murder holes in its skirts that let pale faces drop rocks and other lethal objects if enemies trying to enter the Braavos’ lagoon. Arrowslits decorate the Titan’s massive stone legs. 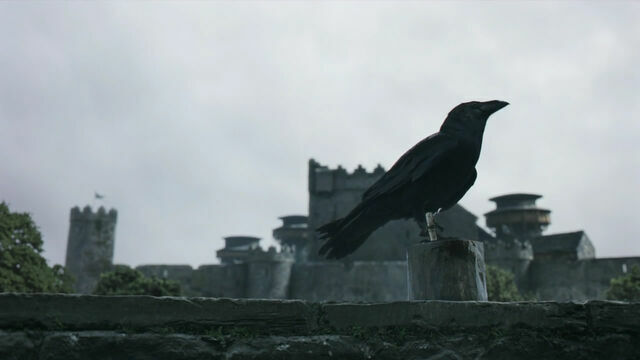 The Titan of Braavos is the city-state’s first line of defense. As ships approach, the Titan bellows a warning so the Arsenal of Braavos can be on alert. Titan of Braavos © HBO. Although the Colossus was not a defensive city water gate like the Titan, the Colossus did commemorate a military victory and the Rhodesians intended the statue to remind prospective enemies of the island’s military prowess. When winter comes to Westeros, it can last years or even decades. The winter of the Long Night, eight thousand years before the series begins, lasted a generation – until the White Walkers were beaten back into the north3 . Still, that doesn’t explain where George RR Martin came up with the idea for a long winter or why. A peasant from the 1200s – note not only his signs of poverty (barefeet) but also how little clothing he wore – presumably this was at least partially due to warmth. The Little Ice Age didn’t create a world wrapped in ice. Rather it is the name given to a climatic period in which Northern countries became cooler, winter storms harsher, and summers wetter. Like a herald ushering in the horseman of the apocalypse, the Little Ice Age quickly went from creating more sea pack ice (1250) to freezing out or starving Norse settlements on Greenland (~1300) to drowning the land and creating the disastrous Great Famine (1315). It is possible to see the cooling climate in portraiture — click the images to enlarge. In the early 1300s, the English queen Isabella of France wore comparatively little clothing. Note the thin sleeves and lack of fur. By 1545, royal women like Catherine Parr wore enormous sleeves stuffed with feathers and covered with fur, presumably for warmth. By her 1588 Armada Portrait, Elizabeth was completely covered. She may have liked the neck ruffs to hide an aged neck, but it is significant that the trend caught on: people did not find the extra clothing too hot. As torrential rains waterlogged Northern Europe soil in the spring of 1315, the left seedbeds sodden, submerged pastures, destroyed fledgling crops and created historically low yields. The 1315 winter was so harsh that ships froze in place in the Baltic Sea and the miserable combination of cold winters and soggy summers hammered Northern Europe for the next three to seven years. The effects of this famine can’t be overstated. When crops failed, reports emerged of people eating tree bark, corpses, and even each other. Many of the average people who didn’t die became exceptionally malnourished. Twenty-four years later when the plague struck, people were still recovering from the malnourishment and chaos – subsistence farming made it hard to get enough calories to replenish their bodies. The Great Famine of India (1876-1878) lasted two years. The Great Famine of 1315 last nearly seven years in some places. This image shows tragic effects of drought on Indian famine victims; there is no reason to suppose the victims of 1315 would have been healthier or better nourished. Image: Wikimedia. During the Little Ice Age, crop failures and famines haunted Europe. Wars led to armies “eating off the land” and only exacerbated food shortages in villages. In fact, the lousy 1780s weather in France caused such severe crop failures that they may have led to the French Revolution. When crop failures turned into grain shortages, the long-abused French peasants came to believe the nobility were hoarding grain (in a conspiracy theory known as the Famine Pact), which led the peasants to revolt. Famine and pestilence from the Wittenberg Bible. In 1816, at the tail end of the Little Ice Age, another event occurred whose name might have given GRRM some ideas: the Year Without a Summer. The Little Ice Age wasn’t brought about by magic, but the effects were so devastating – and the climatic shift so severe and unexplainable — that people certainly blamed its effects on the otherworldly: everything from God’s displeasure to the supernatural. Incidentally, the name of the Lands of the Long Summer – a region in southern Essos bordered on the edge of the Sea of Sighs – may have been inspired by the Medieval Warming Period. The 1315 Great Famine was exacerbated by the population explosion that became, as of the Little Ice Age, more than the land could support. Before the Little Ice Age, Europe experienced the Medieval Warming Period. From about 950 to 1250, warm weather yielded crop surpluses and the population exploded. The English could grow grapes during the Medieval Warming Period. In England alone, the population surged from roughly 1.5 million in the eleventh century to 5 million by 1300.5 When archaeologist Brian Fagan penned a book about Medieval Warming Period, he referred to it by a more colloquial name: The Long Summer. Sound familiar? All of these factors may have gone into Martin’s cauldron when he brewed up the Westerosi climate. Even though Martin’s winter may have medieval origins, it is fully magical. Magic causes the strange seasons in ASOIAF, according to George R. R. Martin, who says the mysterious climate will be explained at the series end. Pieter Brueghel the Elder, painted The Triumph of Death (c. 1562). Note the skeletons on horseback in the painting. The most prevalent symbol of the plague is perhaps the danse macabre or “dance of death” – recurring depictions of skeletons meant to invoke the universality of death that developed in the post-plague period; the plague no doubt felt like an apocalypse to the survivors. Did George RR Martin bring this symbol to life in the White Walkers? The white walker’s horse © HBO. The white walker’s charge © HBO. It seems as though Martin anthropomorphizes the encroaching Little Ice Age into Death on horseback, charging down on the people south of the Wall. It’s not a coincidence he compared the White Walkers to the mythological sidhe. The fairy-like sidhe live in burial mounds. The Triumph of Death c. 1446 was a fresco in Palermo. Death enters riding a skinny horse and launches fatal arrows, just striking a young man in the lower right corner. On the bottom of the fresco are the corpses of the killed. On the left, poor people plead for Death to stop their suffering. Death, however, ignores their pleas. On the right, nobles are indifferent to the suffering. Perhaps, Death mounted on horseback in this image inspired Martin’s white walkers. It seems like Martin anthropomorphized the encroaching Little Ice Age into Death on horseback, charging down on the people south of the Wall. It’s not a coincidence he compared the White Walkers to the mythological sidhe. The fairy-like sidhe live in burial mounds. To the best of my knowledge, George RR Martin has never stated that the geography of Westeros is based on the United Kingdom. Still, the similar shapes – and the narrow seas separating both islands from their larger neighboring continents — are pretty fishy. Martin has, however, stated that he imagines Westeros as being the size of South America. This makes Westeros roughly 73 times the size of the United Kingdom!6 If Martin did base Westeros on the United Kingdom, he certainly supersized it. Not a lengthy or erudite comment here Jamie- just a huge WOW!!! In fairness, I think my Henry ( Bluebeard) the VIII comment was more of a rant or adiatribe. Ha. Oh that’s so lovely. Thank you about your comment, Martine. Your comments about Henry VIII were far from a rant. I thought they were very intelligent and I was a tiny bit envious that you have real-world friends with whom you could discuss old Bluebeard. I really think he doesn’t get nearly the amount of negative criticism that he deserves. Somehow, over the years, a wife killer and chronic perpetrator of judicial homicide has been glamourized. You have obviously given this article much thought in its preparation. I also thought of the Great Wall of China and more recently, the Berlin Wall, in relation to the ice wall in ASOIAF but of course there have been walls built to separate people in many nations throughout history, and GRRM has, as you said, mentioned Hadrian’s Wall himself. I’m learning (or should that be ‘playing havoc with’) British Sign Language, though at a fairly early level at present and the sign for ‘Wales” or ‘Welsh’ is making the dominant hand into a shape like a dragon’s claw, while for Scots/Scotland for example it is miming playing the bagpipes. I know that at one time Ice Fairs were held on the Thames in London because the ice was so thick. That may have been in the 1600s though. I personally have an uncomfortable feeling about Arya’s journey “to the dark side” but then I think of the kids who are taken from villages to be child soldiers in some parts of the world – and I guess in war zones everywhere there are orphans (or children separated from their parents at least) who have to survive as best they can. I know my late mother (who was a young woman during and at the end of the World War 2|) said that in the aftermath of the war there were some refugee children from somewhere in continental Europe who were billeted in an English stately home [don’t know which] who took one of the swans from the ornamental lake for the cooking pot…..they hadn’t become accustomed to living in peace time and were still living as though under war conditions. This third paragraph is a bit off-topic but the above article made me think of it tangentially. I hadn’t thought of the White Walkers in connection with the Danse Macabre. It’s so easy (for me) to see things when it has been explained. I’d love to get Jaime in a room with GRRM so they could discuss matters pertaining to ASOIAF – though of course I don’t want to detract him from finishing “Winds of Winter”. Lol! I would love to get into a room and ask GRRM questions!! Although he might hate it. I think he downplays the history side to prevent spoilers; I’m convinced. Or, maybe it would just take more time to explain the history than he has. Great comment, Watcher. I meant to include one of the posters from the Ice Fairs in the post. Since (strangely enough) comments don’t allow images, I might still try to add it into the article body. I’m fascinated by the idea of the Thames freezing over; it is like a different world. I also think he probably draws on things like the eternal winter in Narnia and winter’s role in general in fantasy (which I’m not fully conversant with, but I’m sure I’ve seen it before). Your last paragraph is wonderful. For some reason, I always forget that Arya is a child soldier. She seems so adult in some ways. But her whole negative arc and perhaps even confusion/losing her way is probably a result of that in some ways. Agree that GRRM intentionally avoids talking about his source material that may be spoilers (eg, wider history beyond Wars of Roses, Norse mythology). The old fox. The Arya chapters are some of my favorite. I was so traumatized by her perilous journey in ACOK. A group of kids traveling on the road in war time with no protection whatsoever; it doesn’t get more terrifying than this. How the 99% survived (or not) is re-imagined in Arya’s chapters and later in Brienne’s chapters in AFFC. So there were two, probably more, Triumph of Death’s. That explains why I had so much trouble tracking down the one I was looking for. As for the Others, in the books and from Martin’s descriptions they’re described as being closer to the sidhe/fairies/fair folk/whatever than dead or zombies. That I believe is more firmly a creation of the show, possibly taking the current popularity of the zombie genre, though given the other ties to medieval art it’s very possible that they were also inspired by the danse macabre works. I suppose Arya and her friends travelling could be compared to a smaller, less disastrous non-religious version of the children’s crusade http://www.historyhouse.com/in_history/childrens_crusade/ – well Arya, Hot Pie and Gendry do get split up eventually and while they band together they are forced to do so by circumstances not religious fervour. I’ve been trying to find a link [with no luck] to a Provencal song that I heard over 30 years that related to the danse macabre. The translation was something like “See death that rolls around, rolls all around you, it follows you like a shadow, it follows you everywhere” and that the king and the queen and all the little princes would be no better off than the poor peasants. I haven’t been to Provence but have been told the provencal language is not used everyday anymore but more for special occasions. A story from my youth about some Polish siblings (and a feral boy Jan) surviving on the road during and after the second world war is Ian Serrellier’s [sp?] “The Silver Sword” http://en.wikipedia.org/wiki/The_Silver_Sword The book was serialised on British children’s TV in the 1950s [says she outing how old she is] though I initially heard Warsaw as Walsall!!! I notice that if the supersized [and reversed???] map of Westeros DOES correspond to mainland Britain, Dorne would correspond to supersized and reversed Devon and Cornwall. I’m not sure about now but in the past Cornwall was somewhat distinct from the rest of England having its own [now defunct] Celtic language. Like the French Brittany it has many Celtic place names. I think you’re right about the wall; Martin used Hadrian’s wall as the symbolic brother to this giant ice wall, denoting quite literally the end of the world. However, the problem with doing this for symbolic effect is that the realism of Martin’s world is called into question somewhat – his long winters might well have some scientific explanation (to be explained in an as yet unpublished “science of Westeros” book perhaps) but the wall is simply too big. In the books, the Wall is even larger than it is in the show, rising around 700 feet into the air and stretching for 300 miles. Many of the battles scenes which take place on the wall become a little silly if it’s really 700 feet high, a distance which no archer could accurately shoot from, and which no invading army of Wildlings would ever get within 500 feet of. GRRM has admitted that he underestimated just how big the Wall was when confronted by a to-scale fan drawing. The show’s shrinking of the wall was less a choice and more a case of narrative necessity. Another point I’d make is that whilst the geographical features of Westeros are far larger than any in medieval europe, an area where Martin’s world is smaller is the governance of the realm. It’s easy to understand why – Tyrion’s chapters in ACOK would lose their edge if they involved Tyrion navigating a more realistic medieval government akin to ones which existed in England or France. In ASOIAF, the government of Westeros is handled by just a handful of people on the Privy Council; the reality would be far more complicated than that. In fantasy, the big, simply things can be made ludicrously huge and the effect is not lost, but more complex social structures and and should be sacrificed for narrative economy. Oh, and your map comparing Westeros with “England” is wrong. That’s the whole of the UK pictured – you just pissed off loads of Scotsmen and Welshmen Jaime! Do you think that readers recognizing history in GRRM’s work reduces the fantastical nature of his world? In terms of the size of the government, one thing that I have noticed is that the king appears to rule in a much more “absolute” way than he would have been able to do in England. Although arguably, Henry VIII for example, often got his way in spite of parliament.